The title says it all: while this particular type of hack might be tempting, it is HIGHLY recommended that all who read the following article do not try this trick at home. The channel’s latest feature is the 10-second toaster and they achieved the impossible: they actually made watching bread convert to toast a fun and exciting event. Here’s a quick recap of everything you’ll see in the video below. The guys started off with a 1,800-watt, four-slot toaster (so each side received 900 watts). The left side was “hacked”, if you will, to allow the Photonicinduction team to increase its power at will, while the right side more or less served as the control. The first phase was meant to see if the power increase would even work: starting voltage was set at 295 with approximately 1.5 kilowatts. 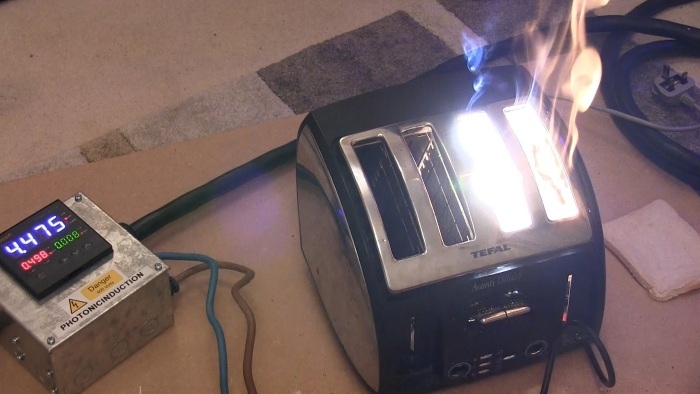 From there, the toaster was pushed up to 330 volts and 1.8 kilowatts. Using this much power, the bread achieve a full toasting in about one minute’s time. For round two, the guys wanted to increase the power to see if they could get the bread to toast faster. Right before the start of the experiment, you can hear them say to push the power up to, and I quote, “stupid levels.” So this time the machine was driven straight up to 345 volts and 2.0 kilowatts of power, peaking at 347 during the toasting.